Homemade turkey dressing is the ultimate side to any holiday turkey dinner. This one holds it’s own. Really, really good. It’s based on the famous bread salad served with the Zuni Cafe roast chicken. That is one seriously fantastic dish. This version is just as good. But adding leek, sage and savory puts it squarely in holiday turkey territory. Turkey stuffing or turkey dressing. That is always a tough decision. Which way to go? What to do? 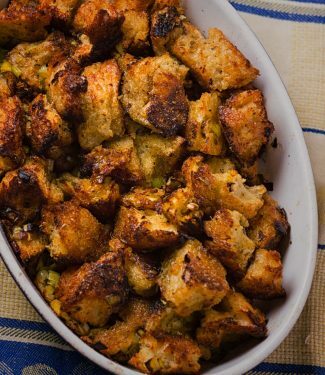 I love turkey stuffing. It’s amazing. How the drippings combine with the stuffing in the cavity while the bird roasts. Fantastic. But it comes with a big price. It makes roasting a turkey even harder. And it soaks up the delicious drippings that I want for gravy. I love my drippings for gravy. All that wonderful fond. That’s the stuff that makes great gravy. Dressing doesn’t have those problems but it’s usually not anywhere near as good. And that’s a problem in itself. Maximum stuffing flavour or bland, mediocre bread on the side. 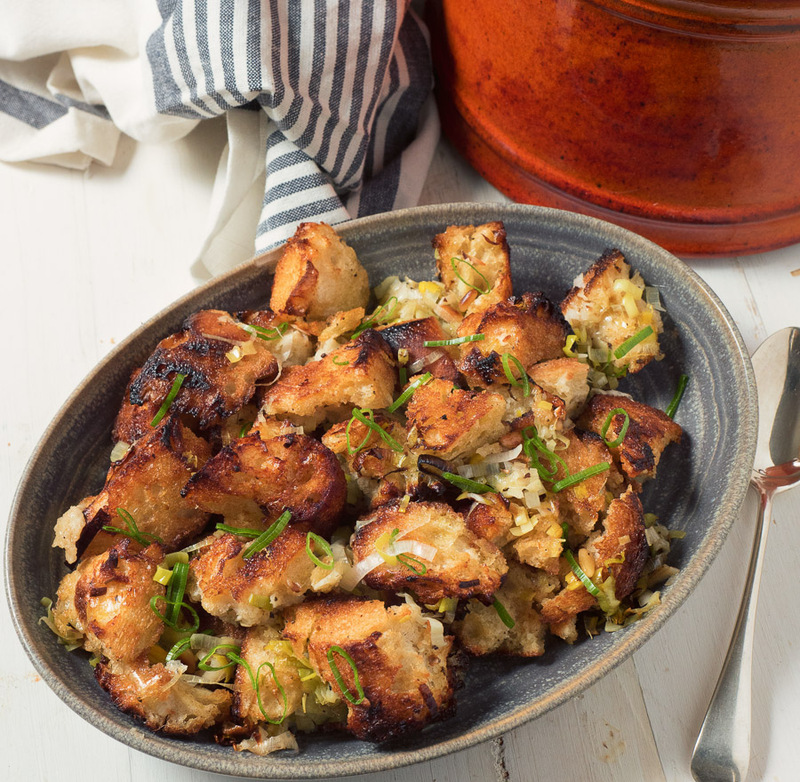 This Zuni turkey dressing takes care of that. It’s a whole new take on how turkey dressing is made. And it tastes every big as good as traditional turkey stuffing. Better even. There’s crispy golden bits. There’s moist turkey flavoured bits. It’s so good it doesn’t need gravy on it. If you’ve tried Zuni Cafe roast chicken with bread salad then you know how good this homemade turkey dressing is going to be. If you haven’t then you are missing out. Google it. Make it tonight. Then you’ll understand why this dressing is going to be the best you ever taste. Homemade turkey dressing packs in the flavour without adding the price. It’s rich. It’s loaded with turkey goodness. Take a leap of faith. Try it. It won’t disappoint. A great alternative to stuffing the bird. This homemade turkey dressing goes in when the turkey comes out so you don't have to worry about space in the oven. You want to use a sturdy white bread. No wonder bread here. You can do this at any time. Remove the crust from the loaf, then slice it about 1 1/2 inches thick. Brush liberally with olive oil. Heat your broiler and toast the bread until golden brown. Be very careful here. The bread can burn easily under the broiler. Let cool and rip into 1 inch pieces. Set aside in a large bowl. Toast the pine nuts in a dry pan over low heat. Heat 2 Tbsp olive oil in a frying pan over medium low heat. Add the garlic and cook about 45 seconds. Next, add the leeks and sweat until translucent - about 5 minutes. Now mix in the herbs and continue to cook over medium low heat for another 3 minutes. Season generously with salt and pepper. Combine leek mixture with bread and add the pine nuts. Moisten with concentrated turkey stock and place in a shallow oven-proof dish large enough to hold the all the turkey dressing. Pre-heat your oven to 375F if not already roasting your turkey. Thirty minutes before you plan to serve (around the time you pull your turkey from the oven), drizzle 5-6 Tbsp of turkey fat siphoned from your roasting pan over the dressing. Cover with foil and place in oven for 20 minutes. Remove the foil and bake, uncovered, for another 10 minutes. Serve as you would stuffing. Bread from a decent bakery makes this a much better dish. Think sturdy and maybe lightly sourdough. Concentrated turkey stock is awesome for this dressing. It will make your gravy the best you have ever had. It's a game changer. In american, sides and stuff. Bookmark the permalink. What temperature should the oven be at for step 4? Suggestions on work plan if I want to do the dressing AND your roasted sprouts? Dressing last? Thanks for catching that mistake. Recipe above corrected. I would suggest putting the brussel sprouts in at the same time as you start the dressing. That way, if the brussel sprouts need a little longer you have some buffer. If they are done early then pull them from the oven, cover with foil and let stand. You can always pop them back into the oven to warm up right before you serve. Also, cook them on two different racks so you have some room to move around. Oh my goodness – you will be my husband’s new favorite person. He LOVES leeks and I never even considered putting it in turkey stuffing. And I love the rustic crusty bread you used. For some reason we’ve always used smaller chunks, but I’m sure this holds up to the fat and gravy attack better. Can’t wait to try this technique on my own Thanksgiving dinner this year! 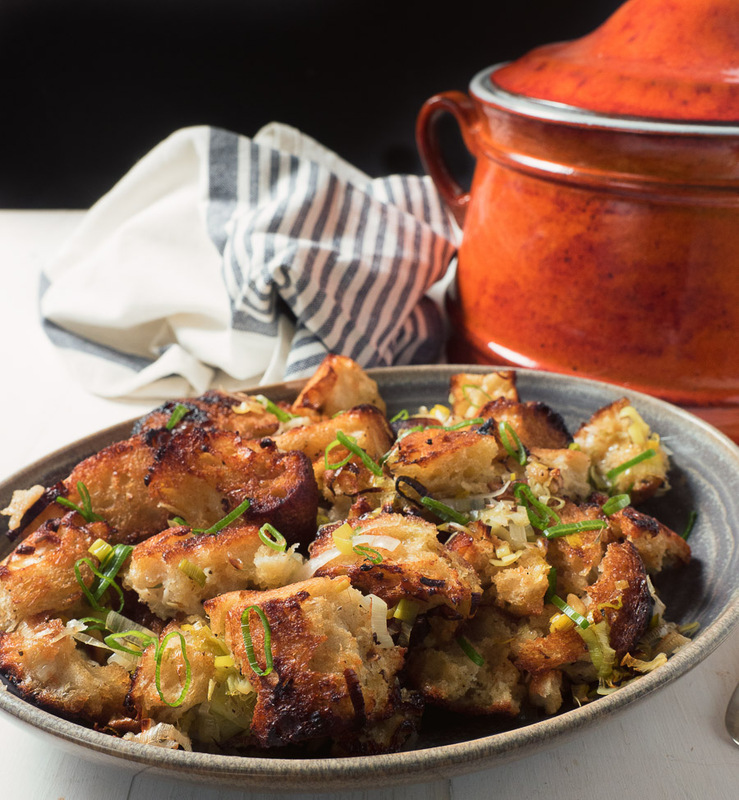 The leeks add a nice earthiness but you are right – the bread is absolutely the key. Sturdy and one inch chunks. The other key is the concentrated homemade turkey stock. The hit you over the head turkey flavour comes from the stock and the turkey fat.